Circular Shapes: Geometry in El Chino Mine, open-pit copper mine, Silver City, New Mexico. Map. Elearning. 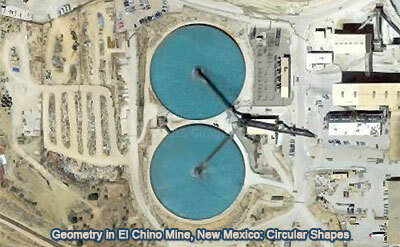 Explore the geometry in El Chino Mine, New Mexico through Google satellite imagery. To Pan: click and drag the map. Take advantage of the zoom bars. The El Chino (the "Chinaman") Mine is an open-pit copper mine located in the town of Santa Rita, 15 miles (24 km) east of Silver City. The huge open-pit mine was once the largest in the world and is perhaps the oldest mining site still being used in the American southwest. Read more. See also: El Chino Mine Open Pit Map.